Columbia Sportswear Is a Reliable Name For Kid's Winter Gear! As I flipped through photos of my kids playing outside during the winter, I noticed a commonality in many of the photos: my kids were often wearing Columbia Sportswear outerwear through the years. Of course this was not a coincidence: I had sought out warm outerwear for the kids, and the Columbia Sportswear name had been recommended to me by many friends with young children. After buying and trying the outerwear on my own kids, I found it to be warm, well-made, and durable enough to pass down from child to child. The Gang Wearing New Columbia Winter Jackets! 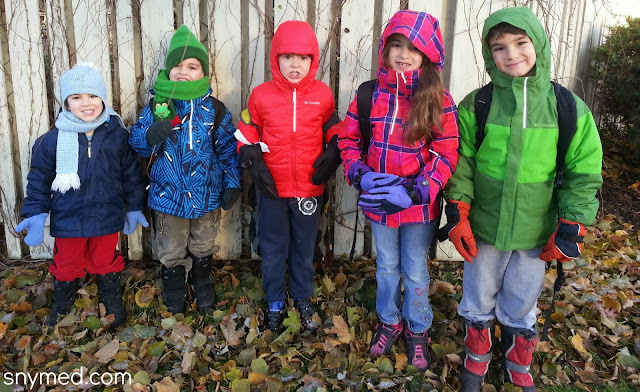 This year I thought it would be great for the kids to have brand new winter outerwear, and not hand-me-downs. If you also hand clothing down from child to child, you will know that there gets to be a point when it's time to retire well-used pieces. This was the case with us. You can see a photo of my whole gang wearing their new Columbia jackets, above! 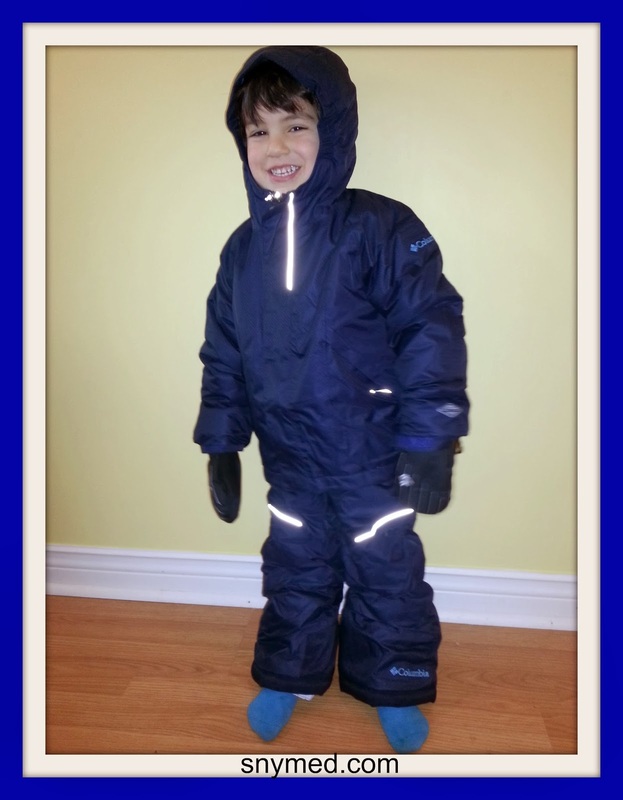 They each also received a pair of snow pants and mittens, so see below for photos! There are many features that make Columbia Sportswear a reliable provider of quality kid's outerwear. Some features that I appreciate as a parent include Columbia's waterproof mitten line (for dry hands), the "outgrown" internal sleeve/pant system for kids on their jackets and snow pants (which extends the clothing in length by an additional 1.5"), the "omni-tech" waterproof, breathable fabric (to keep the kids dry and comfortable), the adjustable waistband on snow pants (great for skinny kids), and the "omni-heat" thermal reflective layer offered in many of Columbia's jackets and snow pants ("keeps kids 20% warmer by reflecting back the heat that they generate"). I also love that the cuffs on the jackets and snow pants keep out the winter elements; the snow pants have reinforced knees to prevent tears, and that there's reflective piping on the Columbia outerwear to keep the kids visible (to cars) at night. Keeping the kids warm and safe! Columbia Boy's Alpine Action Jacket, Whirlinator Snow Pants & Snow Raid II Mittens! Above my oldest son is wearing the Columbia Sportswear Boy's Alpine Action Jacket in dark backcountry (green), $90 USD. The jacket is omni-heat thermal reflective with omni-tech "stay dry in wet conditions" fabric, as described above. He's also wearing the Columbia Boy's Whirlinator Waterproof Snow Pants in black, $90 USD, which are also omni-heat thermal reflective and is constructed with omni-tech fabric. Both feature the "outgrown" cuffs, which grow the sleeve and pant cuffs an additional 1.5" to accommodate growth spurts! To complete his set, he's also wearing the waterproof Columbia Youth Snow Raid II Mittens in black, $35 USD. Look how toasty warm he is! 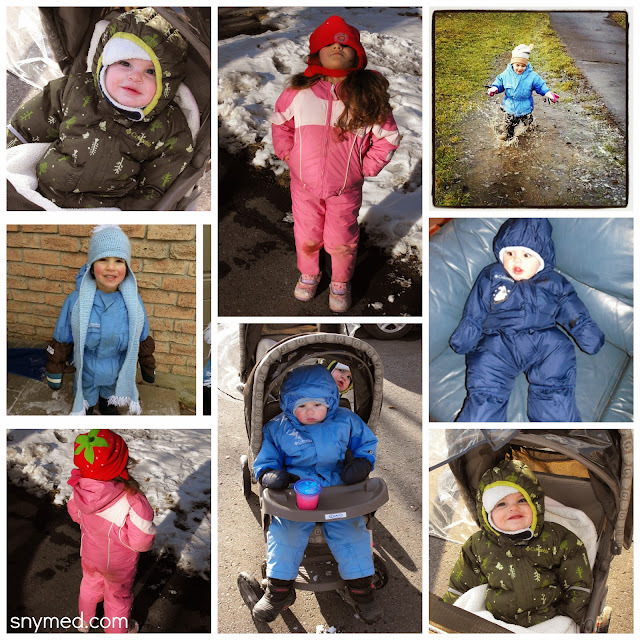 Columbia Girl's Bugaboo Interchange Jacket, Whirli Diva Snowpants & Snow Raid II Mittens! My daughter is wearing the Columbia Girl's Bugaboo Interchange Jacket in Red Hibiscus Plaid, $120 USD. It features omni-tech "stay dry in wet conditions" fabric. 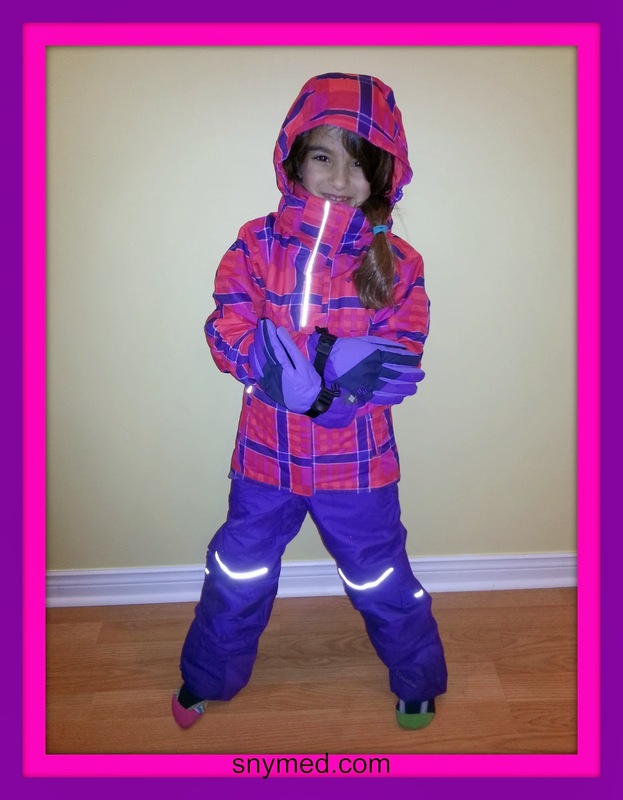 She's also wearing the Columbia Girl's Whirli Diva Insulated Snow pants, in hyper purple, $90 USD, which also feature omni-tech fabric. Both jacket and snow pants feature the "outgrown" cuffs, which grow the sleeve and pant cuffs an additional 1.5". To keep her hands warm and dry while making snowballs, my daughter is wearing the Columbia Omni-Heat Snow Raid II Gloves in hyper purple, $35 USD. I mentioned above that these are wonderfully waterproof! Columbia Boy's Shimmer Me Jacket, Bugaboo Snow pants & Raid II Mittens! My second son is wearing the Columbia Boy's Shimmer Me Insulated Jacket in bright red (camera makes it look a different colour), $85 USD. It features omni-heat thermal reflective technology and "omni-shield" to resist rain. If you're in Canada, I would call this a fall jacket; if you're in an area of the US that doesn't often get snow, this would be a winter jacket. He's also wearing the fantastic Columbia Boy's Bugaboo Insulated Snow pants in black, $70 USD, which feature omni-tech "stay dry in wet conditions" fabric. The snow pants include Columbia's "outgrown" cuffs, which grow the pant cuffs an additional 1.5". I love how it says "Columbia" in large letters on the left leg--very cool! Just like his older brother, he's also wearing the waterproof Columbia Youth Snow Raid II Mittens in black, $35 USD. 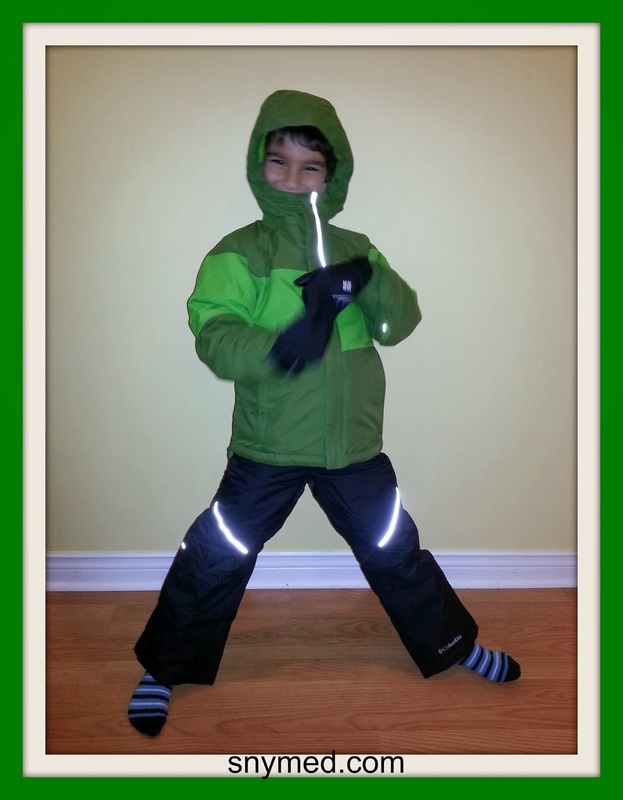 Columbia Boy's Evo Fly Jacket, Whirlinator Snow pants, & Chippewa II Mittens! My third son is wearing the Columbia Boy's Evo Fly Jacket in Collegiate Navy Crosshatch, $99 USD. It has been wonderful for him with snow and winter having come early in Toronto. It features omni-heat thermal reflective technology and "omni-shield" to resist rain. He's also wearing Columbia Boy's Whirlinator Waterproof Snow Pants in Collegiate Navy, $90 USD, which are also omni-heat thermal reflective with the omni-tech fabric. Both feature the "outgrown" cuffs, which grow the sleeve and pant cuffs an additional 1.5" to accommodate growth spurts! To protect him from the cold, he's also wearing the Columbia Chippewa III Mittens, in riptide pattern, $25 USD. These feature omni-stain fabric (resists rain and stains...hey, that rhymes)! I would recommend these mittens for a child up to 2-years old. I love this little snow outfit, and he's warm and adorable in it. Columbia Boy's Whirlinator Set & Chippewa II Mittens! My 4th son and youngest guy has really been loving this Columbia Boy's Whirlinator snow set in Collegiate Navy, $150 USD (for the set). He has been very warm and happy in the set, and okay, cute! The set features omni-heat thermal reflective technology to keep him warmer, with the omni-tech "stay dry in wet conditions" fabric. Both pieces include "outgrown" cuffs, which grow the sleeve and pant cuffs an additional 1.5" to accommodate growth spurts! To seal out the cold, he's also wearing the Columbia Chippewa III Mittens, in black, $25. These feature omni-stain fabric (resists rain and stains). I would recommend these mittens for a child up to 2-years old. With their outdoor lifestyle of tobogganing, snow fights, building snow forts, and doing winter trampoline, the kids will be warm, dry and comfortable in their Columbia Sportswear this late fall and winter season! Follow Columbia Sportswear on Social Media! What part of the body (hands, face, feet, ears, etc) do you have the hardest time keeping warm in the winter? Have you or your child/grandchild ever tried Columbia to ward off the winter? 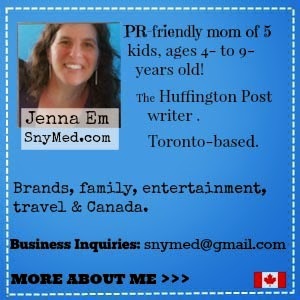 Oh my gosh, Amy, yesterday 3 of my kids had soaking wet boots after jumping in deep puddles! Columbia Sportswear is AWESOME! I worked for years in promotional items and we always had clients begging for Columbia Sportswear (they are known for quality and style). Christine, yes, Columbia has a great reputation. I love Columbia! Your kids are so cute and the jackets and pants look great! Very colourful yet very functional! Oh my gosh! How cute are your kids in Columbia! 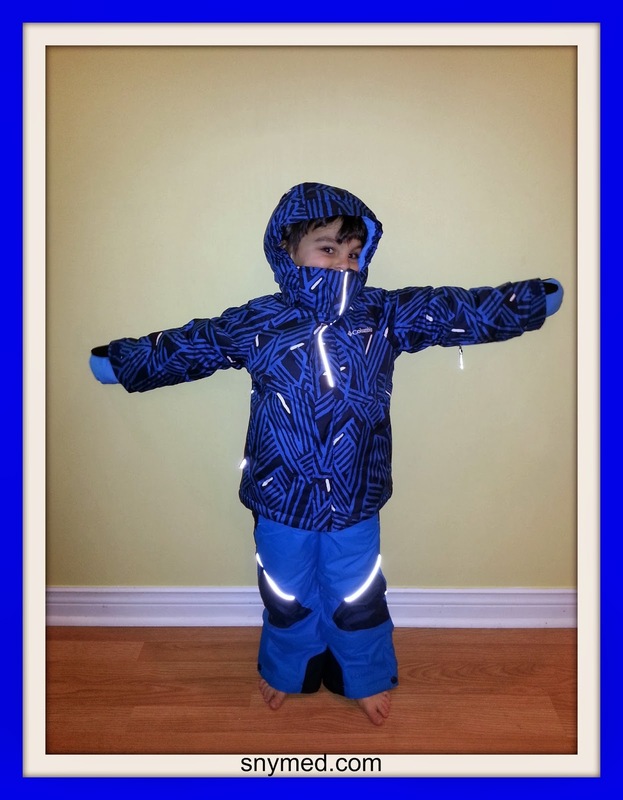 Yes, Columbia is one of those brands that I trust for keeping my kids warm in extremely cold Alberta winters. And my kids are happy to wear the brand too! Quality and affordability! Thanks Angie! My kids have been enjoying their Columbia outerwear this year! Oh Columbia is just the best quality kid's outdoor wear. And for adults also it is so reliable and waterproof. Well worth the money and comparable to other products as well. Paula, with our Canadian weather we really need quality outerwear that will keep us warm! 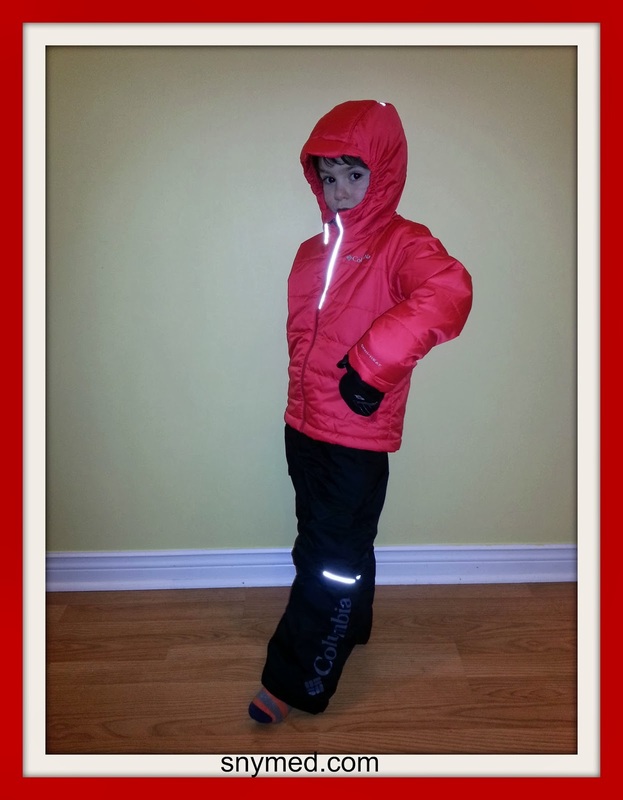 Columbia is a wonderful brand and your kiddos look great Jenna ( cold weather gear has to be fashionable, right?!) I do find them a little out of our price range unfortunately, but can see the benefits of owning them. Thanks for sharing! I have a green and white Columbia winter jacket. I love it to pieces!! Sadly it's a little torn up, high time I replace it. Btw, your kids look adorable in them :) Thanks for sharing the photos from when they are younger. That green infant snowsuit, we got that as an early Christmas present for our son. He hasn't worn it much, just because it is so warm, he sweets till the point of everything he is wearing is wet. When we are going to spend a lot of time outside, then he will wear it, but just running to the car and back, he is wearing something not so heavy/warm. I have a hard time keeping any part of my body warm, and really want to get myself Columbia gear since I have heard great reviews for years now!!! now that's gear suited for this winter! I recently picked up some winter Columbia snow gear at a super uber discount for next year. I do agree that Columbia makes great sportswear for both kids and adults. For some brands, I feel that they skimp a bit on kids wear, but it's not true with Columbia! Columbia truly makes clothes many children will enjoy.